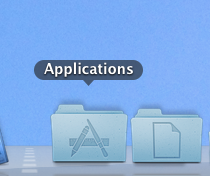 OK, so I know this is a fairly obvious one but not everyone knows that it is possible to keep a “shortcut” to your Applications folder in the Dock. This is super useful particularly when installing things (as you have to drag them into the Applications folder) and also for general easy access to your apps. Of course some of the more modern OS X versions have something similar already, but for the rest of us this is a really handy thing to have in your Dock. 1.) 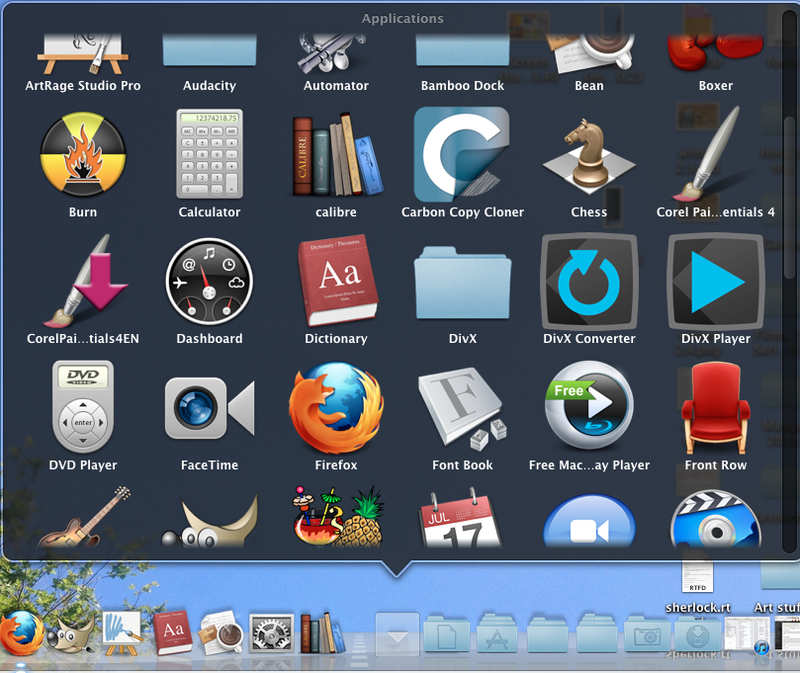 Open a Finder window and from the left-hand menu choose Macintosh HD. 2.) 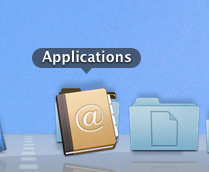 In your Macintosh HD folder you will see the Applications folder. 3.) 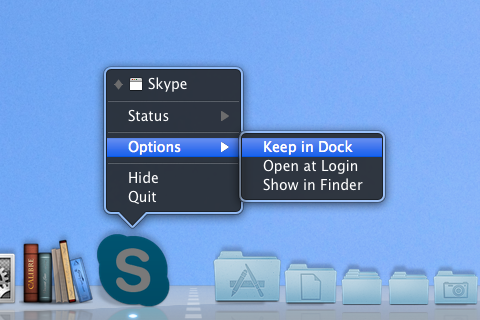 Drag the Applications folder from your Macintosh HD folder to any part of the right-hand side of the Dock (remember files and folders must be stored on the right-hand side of the dotted dividing line!). I personally keep my home and music folders in the Dock too as I access them all the time. So much easier! 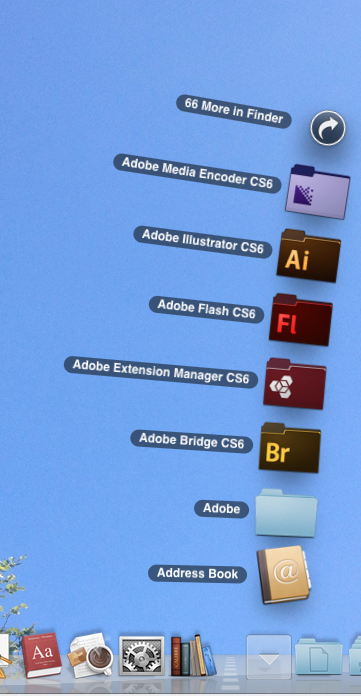 You have a couple of different options on how the Dock folders look and work. To access these options simply right click on the folder. Your folder content fans out in a sort of leaning tower of Pisa imitation. The downside is it can only show a limited number (about 7 on my Mac) and doesn’t allow scrolling through the items. Your folder content shows up in a large square speech bubble with all the contents displayed as icons. This is my favourite option as it is clear and easy to navigate. This is probably because I only really navigate my apps this way (the rest of the time I would just open the folder), and the icons are so large and easy to distinguish. I find icons easier to navigate. Plus, you can scroll easily through the whole folder. 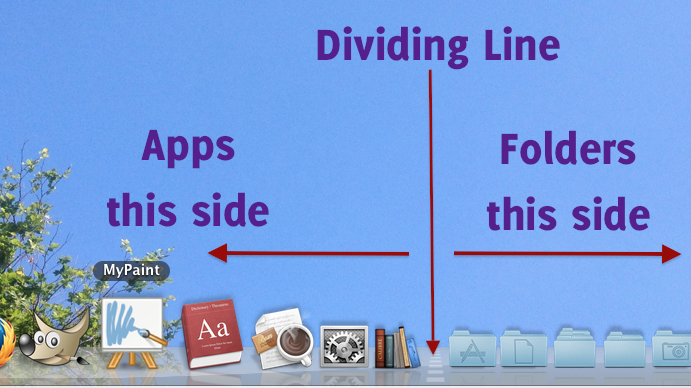 Your folder content shows up in a tall rectangular speech bubble with a small icon and the full title of the app on one line. Again this is easy to navigate, allowing easy scrolling. The display is smaller and focuses more on text than icons so if you find scrolling through names easier this is the one for you! There is of course the “Automatic” option as well. 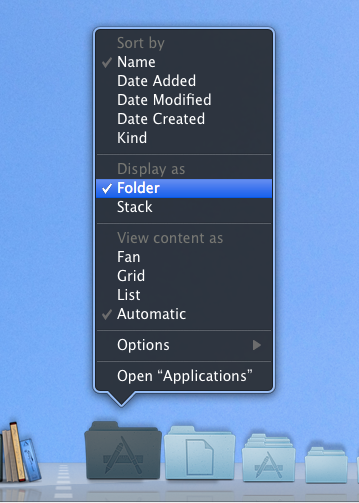 I think this setting just works out what you prefer to use and opens folders in the same way. Is there a tweak to get rid of the white base in the dock which masks the white dot indicating whether an app is open? Although this is quite old now -from back in the day when Snow Leopard (my OS) was still new- the basic principle should be the same.